I’ve been pretty excited about the Chevy Volt. If only my current car weren’t just four years old, with just over 15,000 miles driven, I would trade it in for the Volt. What with my averaging 308 1/3 miles per month, or just over 10 miles per day, I’d be a perfect candidate. The Volt’s gas engine would rarely kick in to re-charge the battery. Let’s say you bought this car, a Cadillac CTS-V Sport Wagon, with a 6.2-liter, 556-horsepower Corvette V8, six-speed manual transmission, magnetorheological dampers (I’ll get to that), Michelin SP2 gumballs, 15-inch front Brembo brakes with six-pot calipers, and microsuede wrapping on the steering wheel and shifter. Well, first of all, you’d be one strange cat, which is to say, unusual. Notwithstanding any nitro-burning ice-cream trucks or flying boattail Rollses in your neighborhood, this wagon is about as esoteric an automobile as you’re likely to find. Statistically speaking, General Motors will sell exactly none of these cars, the Detroit equivalent of Zoroastrianism. But if you did buy one, what would you do with it? You’d have a lot of options. 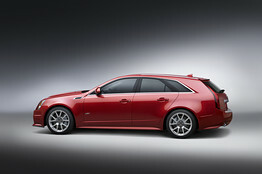 Like Cadillac’s 3.6-liter CTS wagon—with a mere 304 hp—the V-Wagon has a useful and accessible 22 cubic feet behind the rear seats and a generous 56 cubic feet with the second-row seats folded. Among other things, you could take three weeks’ worth of groceries to the test-and-tune session at your local drag strip. Zero to 60 miles per hour in this car goes by in 4.3 seconds—such acceleration momentarily takes years off your sagging jowls—and then the car really starts to move, thundering through the quarter-mile in 11.9 seconds at 116 mph, according to my colleagues at Car and Driver, who do impeccable instrumented testing. Such a car would be useful if you wanted to duck car-pooling duty or avoid field trips with the Cub Scouts, because no child emerging weepy and jelly-kneed from the back seats of this supercharged washing machine will ever want to get back in. You’ll be on cupcake duty from then on. You could attempt to redeem yourself for such an automotive purchase, as you should. The V-Wagon is utterly, cosmically and seismically wrong, a filthy, shameful ogre of torque that bellows and sets alight thatched roofs as it drives by—Caliban with pushrods. You owe God or somebody an apology. Perhaps you could put on demonstrations for the local high-school physics club, using the g-meter built into the car’s instrument cluster to show exactly what more than 1 g of lateral acceleration feels like. It feels like a fat lady is trying to push you out the side window. Or if not physics, the Greek club, since like Antaeus the V-Wagon maintains an Olympian grip on the earth and draws strength from it. Maybe you could help out at the police training range, letting cadets chase you to improve their hot-pursuit driving skills. Then, having been completely demoralized, these plebes will quit to become firemen. The world needs firemen. What you couldn’t do is volunteer to rush transplant organs to faraway hospitals, because if you did, you’d only arrive with coolers full of gazpacho. Over at Chrysler, I can’t tell you much about the new Chrysler 200, but I can tell you to watch the two-minute ad for it that was the high point of yesterday’s Super Bowl. (Just click play on the embedded video above.) The Joe Louis fist. Diego Rivera’s Detroit Industry fresco. Eminem: “This is the Motor City and this is what we do.” A paean to manufacturing and to what made America great. Stirring, even if Fiat does own a big chunk of Chrysler. And speaking of what makes America great, even if this one is made in Japan, have a look at yesterday’s NYT car review, Ezra Dyer’s droll look at Infiniti’s new behemoth. To address this problem, Infiniti’s Around View monitor uses multiple cameras to digitally stitch together a bird’s-eye view of the vehicle, which is mighty useful in parking lots and other close quarters. A blind-spot-warning system lets you know when a Miata is swimming like a remora off your rear flank. You could probably live without the Theater Package’s twin DVD screens, but the Technology Package should be considered mandatory. It includes Distance Control Assist, which uses lasers to scan the road ahead; if it concludes that you’re on a collision course with a car or other obstacle, the accelerator pedal physically pushes back to clue you in to slow down. If you’re still oblivious, the QX hits the brakes for you, which could be a real boon in mind-numbing stop-and-go traffic. The system really works; I drove the QX several hundred miles and didn’t crash into a single thing. I attribute this success to Distance Control Assist, my own careful driving and the fact that the QX56’s front-end styling physically repels most living things. One gentleman driving ahead of me took a look in his rearview mirror and promptly set a new land speed record for an octogenarian in a Buick Park Avenue.